DAVID BRATTESANI was born 1842 in Parma, Italy. He is our Giuseppe’s brother.David married Anna Maria Coffrini. She was the sister of our Lucia Coffrini . We know that David lived and worked in Scotland for a while and we find him in the 1901 Scottish Census living with his niece Valentina Brattesani Quilietti who had been recently widowed. Giuseppe Brattesani age 60, Annuinant, this was her father. Sante Brattesani, age 28, fish shop assistant. This was her cousin, son of David Brattesani, mentioned above. She married him a couple of months later. John Brattesani, age 24, fish shop assistant, Cousin, also son of David above mentioned. Minnie Brattesani, age 19, Confectioner’s shop keeper, sister. 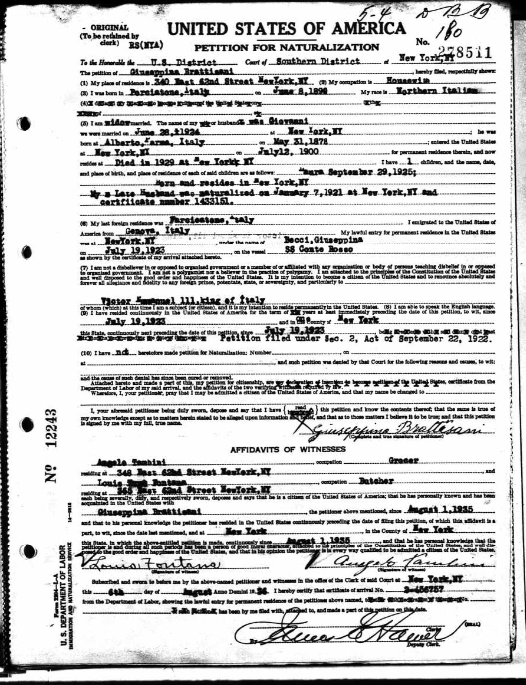 Joseph Anjelo was not residing with the family on the night of the census. He was residing around the corner with the Glass Family who also helped raise the Quilietti children after the death of Emilio Quilietti in 1898. John Brattesani was born in the year 1877. 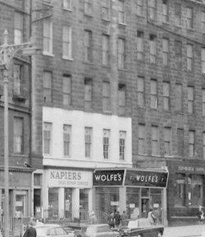 Although in Edinburgh in 1901, it is documented that he eventually went to New York, probably to be with his sisters. Whilst in New York he met and married Giuseppina Becci whose family had arrived in the city some years earlier. They married in the year 1924 in Manhatten, New York. Unfortunately John died five years later. As far as I have researched there were no children. Giuseppe Brattesani was born on 18th October 1876 in Borgotora. He married Rosa Gasparini. As far as I can see he visitied the USA on occasion where his son had emigrated. Their son was Domenico Brattesani and he in turn married a girl called Italina Bardini. 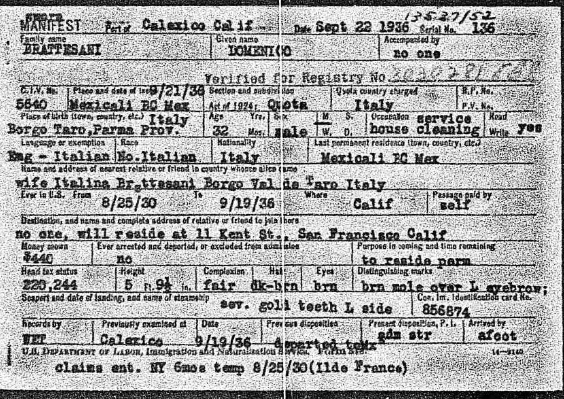 Domenico had gone at first to Mexico but documentation tells us that he walked on foot across the border to arrive in San Francesco. They had two sons, John born 1930 and Joseph born 1941. Domenico died in December 1995 in San Francesco. Daughter Julia Brattesani was born in the year 1885. She married in Italy Bruno Moreno in Italy. Their offspring Giovanna, Giuseppina and Lisa Moreno. All born in Borgotora. Rosa Brattesani was born 1895. We find her aboard the S.S. La Lorraine crossing theAtlantic Ocean in 1912 leaving from le Havre’ in France to New York. She gives David Brattesani as her father. And she was travelling to see her sister Maria Brattesani and husband Ferrari. Address 748 Kerry Street. Her place of birth looks like Albergo in Parma. She married unknown Zanucci. Maria who married into the Ferrari family. 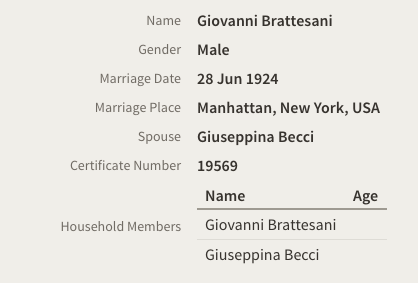 There were also Ferrari/Brattesani connections in Scotland John, who is mentioned in the above census also emigrated to the USA . He married Giuseppina Becca in New York in 1924. However shortly afterwards in 1929 he died.